Puzzle in a world of magic and wonder in this mystical challenge. 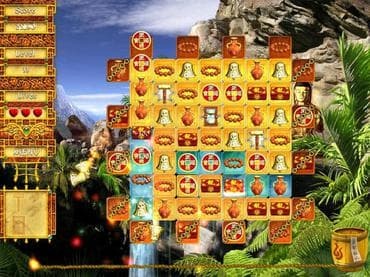 Set to stunning vistas, this puzzler puts you on a quest towards ten powerful talismans. Arrange swords, coins, lanterns, scrolls and other sacred relics into groups of three or more and collect these ancient charms. Race against a burning fuse in Classic mode or take your time in Timeless mode. A dazzling match-three puzzler, 10 Talismans is a breathtaking brain-bender. Free Game features: - Unlimited Play; - Two Game Modes: Classic and Timeless; - 80 Puzzling Levels; - Stunning Backgrounds; - Explosive Power-Ups. If you have questions about 10 Talismans game, please contact us using this form.